ABBOTTSTOWN, PA, 9/23/2017 – In his victory lane interview, Lance Dewease mentioned he hadn’t been good all night. Turns out he was good enough to win his first Dirt Classic and take home $20,000 on Saturday Night at Lincoln Speedway. Winner of the 2nd Dirt Classic, Brian Montieth, started on the pole of the main event with Gerard McIntyre Jr. on the outside. Montieth took the lead on the start with McIntyre settled in second. The leaders hit lapped traffic on lap 7. As Montieth worked his way through lapped traffic he hit the wall on lap 10 opening the door for McIntyre to take the lead. Montieth caught a break when Tyler Ross spun out in turn 4 on lap 11 bringing out the caution. McIntyre was able to hold off Montieth on the restart and held the lead until Cory Haas got turned around on lap 15 in turn 1 bringing out another caution. McIntyre couldn’t hold off Montieth on the restart and Montieth took the lead back on lap 16. Anthony Macri flipped in turns 1 and 2 bringing out the red flag on lap 26. As the field was lining up for the restart, the right rear on the leader’s car was going flat. Montieth took the green flag for the restart but his tire did not hold up allowing eighth place starter Lance Dewease to take the lead passing both Montieth and McIntyre. Montieth pulled off the track on lap 27, ending his night and his attempt at being the second repeat winner of the Dirt Classic. After some contact with Danny Dietrich on the front stretch, Freddie Rahmer brought out the caution on lap 32 with a flat tire. Dewease held onto his lead on the restart with McIntyre in second and a charging Dietrich in third. Dietrich got around McIntyre on lap 37 and had his eyes set on Dewease. Three laps were not enough for Dietrich to catch him and Dewease took the checkered flag with a 1.05 second advantage over Dietrich. Lucas Wolfe crossed the line third, Gerard McIntyre held on to finish fourth and James McFadden completed the top 5. Hard charger of the night, JJ Grasso finished sixth from his 20th starting spot. Greg Hodnett, Chad Trout, Kerry Madsen and Matt Campbell rounded out the top 10. 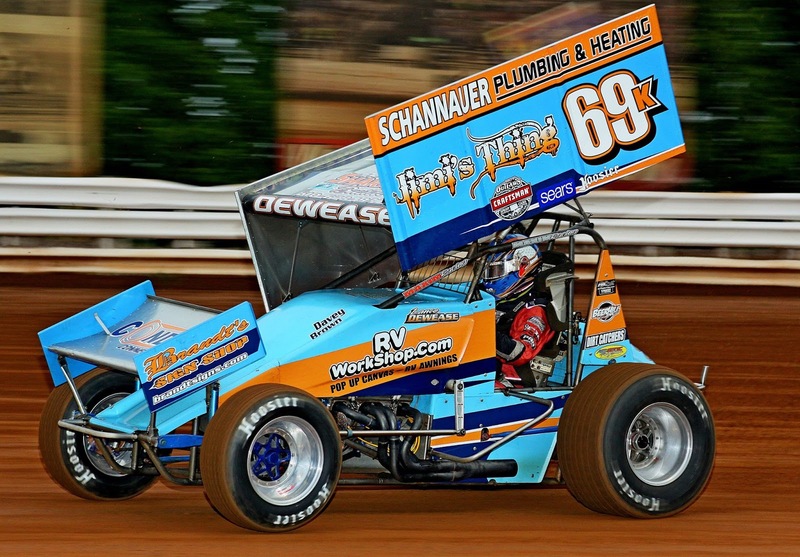 Thirty-seven cars were on hand at Lincoln Speedway for the 4th Dirt Classic on Saturday Night. Drivers of the 37-car field represented 11 states and Australia. TJ Stutts set fast time with a lap of 13.547 seconds averaging 99.653mph around the 3/8-mile oval. The first set of heat races were won by TJ Stutts, Brian Brown, Lucas Wolfe, Gerard McIntyre and Freddie Rahmer. When the field was set up in reverse the heat winners were Tim Wagaman, Danny Dietrich, Brock Zearfoss, Kerry Madsen and JJ Grasso. Tyler Ross, Alan Krimes, Brock Zearfoss and Matt Campbell transferred out of the B-main to complete the 24-car field for the main event. During the driver’s meeting, it was announced that the 2018 Dirt Classic will pay $25,000 to win and $1,500 to start the main event. Next Saturday, Saturday, September 30th, Lincoln Speedway will be idle to allow drivers and fans to attend other local big season-ending big races. In two weeks, Saturday, October 7th, at 6 PM, Lincoln Speedway will run its final race of 2017 with the running of the BOB LEIBY MEMORIAL (Rescheduled from Sept. 2nd) along with the HANK GENTZLER MEMORIAL MANUFACTURERS APPRECIATION RACE PRESENTED BY PANCHO’S RACING PRODUCTS featuring the 410 Sprinters, along with the 358 Sprints who will go one last time for points in the season-long battle for the Lincoln Speedway 358 Sprint track championship. The All-American Outlaws will round out the 2017 season finale. Gates will open at 4 PM. There is a scheduled rain-date for this program the following day, Sunday, October 8th @ 6 PM. Time Trial Results - 1. 11-TJ Stutts, 13.547-seconds (99.653 MPH); 2. 59-Jimmy Siegel, 13.559; 3. 24-Lucas Wolfe, 13.641; 4. 16-Gerard McIntyre, Jr., 13.642; 5. 51-Freddie Rahmer, 13.674; 6. 69K-Lance Dewease, 13.683; 7. 21B-Brian Brown, 13.723; 8. 21-Brian Montieth, 13.747; 9. 1Z-Dale Blaney, 13.754; 10. 39-Cory Haas, 13.809; 11. 1W-Eric Tomecek, 13.840; 12. 17A-Austin McCarl, 13.847; 13. 2W-Glendon Forsythe, 13.853; 14. 39M-Anthony Macri, 13.863; 15. 87-Alan Krimes, 13.886; 16. 88-Brandon Rahmer, 13.895; 17. 1X-Chad Trout, 13.916; 18. 24t-Terry McCarl, 13.924; 19. 3-James McFadden, 13.926; 20. 44-Trey Starks, 13.937; 21. 27-Greg Hodnett, 13.959; 22. 48-Danny Dietrich, 14.016; 23. 5-Tyler Ross, 14.018; 24. 2M-Kerry Madsen, 14.031; 25. 71M-Dave Blaney, 14.098; 26. 1*-Tim Wagaman, 14.109; 27. 69-Tim Glatfelter, 14.116; 28. 3B-Randy Baughman, 14.128; 29. 23-Chris Arnold, 14.129; 30. 37-JJ Grasso, 14.251; 31. 16C-Matt Campbell, 14.277; 32. 19M-Landon Myers, 14.309; 33. 3Z-Brock Zearfoss, 14.311; 34. 3K-Tim Kaeding, 14.379; 35. 21T-Scott Fisher, 14.499; 36. 55K-Robbie Kendall, 14.650; 37. 10K-Joe Kata, 15.169.